The people I’ve been listening to say that one of the most important things us able-bodied white folks can do is to signal boost. 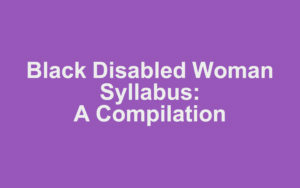 So I thought I’d share the list of books and resources that Vilissa Thompson compiled about being black, disabled, and a woman. Most of what I see coming across my BookLikes feed is fiction, but perhaps someone who is looking for something to read in response to the current US upheaval or for Black History Month will now hear Vilissa and the others she mentions.